ENGAGE all your stakeholder in your STRATEGIC PLAN and accelerate implementation. Strategy Summit® is a fully customized, in-depth strategic planning engagement. Each phase is designed and facilitated by the Focused Momentum® core team providing full access to all the Focused Momentum’s planning tools, techniques, and experience. This program unites all stakeholders to create a common vision for the future and define a comprehensive strategic direction to achieve success. 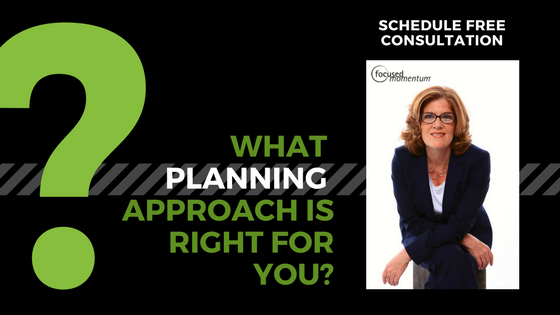 We co-design the best possible strategic planning process to address your specific planning needs. This includes a complete Strategic Assessment (inclusive of stakeholder engagement, market analysis, and evaluation of current business model performance), a 3-day Strategy Creation session (up to 40 participants), a 2-3 month Strategy Development process culminating with a 2-day Strategy Integration session. A new Strategic Plan to guide decision-making and detailed planning. A shared long-range Vision of Success. Clear Core Strategies to evolve your business model and Strategic Milestones that mark the evolution you will make over time. Finally, a 12-18 month implementation plan to align action to goals of the first strategic milestone. All documented using Focused Momentum® templates. One reason strategic planning efforts fail is that their potential is limited by problem-solving. In managing a business, problem-solving is a strengthen. But if you rely on this strengthen to engage in strategic planning, you will find great ideas cut off or discarded before they can realize their potential. Watch this short video to learn the difference between problem-solving and strategic planning. "Working with you has been a wonderful learning experience for me and I was so impressed at how you kept us on track and continued to challenge our thought process without shutting things down. Emily is amazing as well, so talented and able to take all of that “speak” and illustrate it in a way that is clear and concise. It is clear why you are so successful." "Focused Momentum took this assignment on short notice and in mid-stream, and Cecilia and her team excelled. I can’t even imagine the ways in which anyone could have done better in this assignment. Maybe Wonder Woman, but short of a super-hero, I’ll take Cecilia." "A very well run retreat. Flowed well, group stayed on track, I was able to stay focused myself which is normally hard ..."
"Cecilia does a terrific job moving us through the planning process and making us address the more difficult issues. The strategic planning session was very effective in getting agreement on: a new mission statement, a framework for evaluating opportunities and making go/no go decisions about those opportunities, and initiatives for programs and development." "Clear direction for strategic planning and really good focus on big picture. Great follow through. Love the 1, 2, 5, 10 year planning." Cecilia and Emily facilitate conversations amongst the group without swaying the conversation. They kept the group on track and allowed us to formulate our thought and objectives." "I have been through several strategic planning processes in the course of my career and I believe this was the most productive." "Continuity, great ability to listen and interpret, ability to keep a large, changing group focused." "Great strategic framework! Cecilia has the best strategic mind I have ever worked with." "Cecilia brought tremendous expertise that she’d gained from other similar, and dis-similar assignments. She was quick to understand the nature of the assignment, to break it into manageable parts, and to give it better direction, purpose, and output. She added value in ways that we didn’t even anticipate when we first contacted her. "I give a lot of credit to you and your program to help us transform from a mom and pop, to a focused and results generating organization."